The team at DCM Classics is looking forward to see all the hours of hard work pay off. Check out the build below. 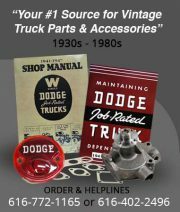 This entry was posted in Customers' Projects, DCM Classics and tagged 1946 Fargo, @dcmclassics, DCM, DCM Classics, Dodge, Dodge Truck, Fargo, Fargo Truck, FLS60s 2.5 ton Fargo. Bookmark the permalink.